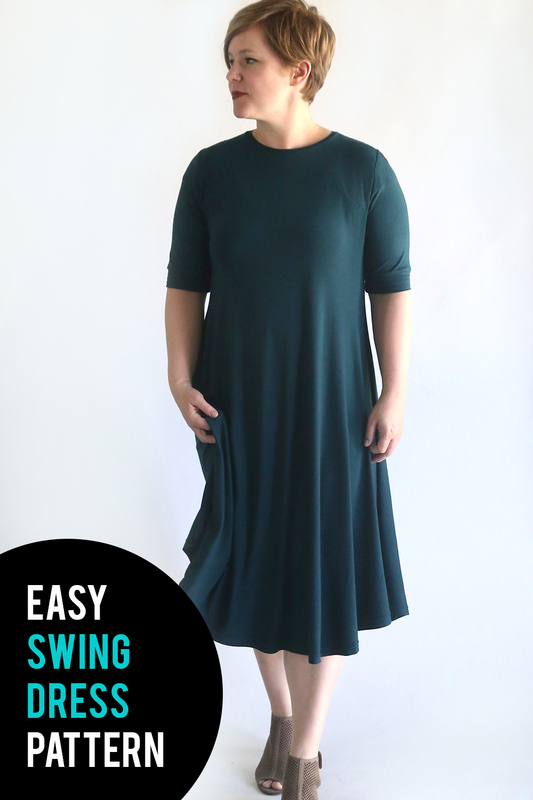 Ever since I shared a free swing tunic pattern with you a few months ago I’ve been wanting to see how easy it would be to turn it into a swing dress pattern. Turns out it’s dead simple! I love the ease of swing dresses – nothing clinging or constricting, just soft material that flows in a beautiful, muffin-top concealing sort of way. Definitely my kind of dress (and perfect for the upcoming holidays since you can eat all you want and never worry about the waistband feeling too tight!). 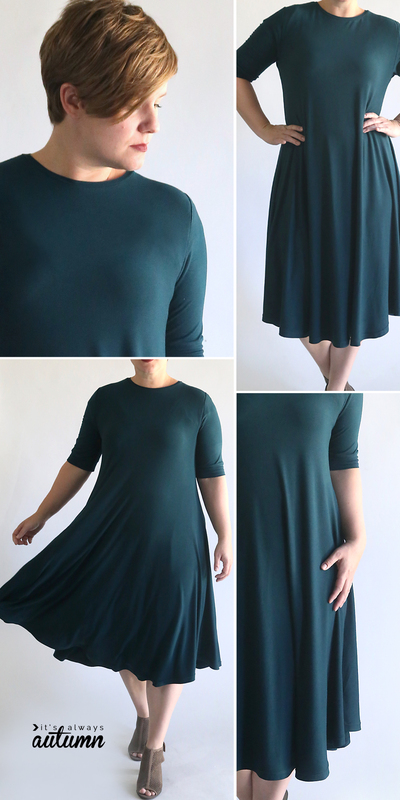 I made my dress midi-length, but you could easily go knee length or even longer if you wish! All you have to do is add some length to the free swing tunic pattern found here. NOTE: all my patterns are women’s size L, made to fit a 38 in bust. This pattern is very roomy around the hips and it’s made for stretch fabrics, so it may fit an XL as well. I used 2.5 yards of 60 inch wide knit (stretchy) fabric. Be sure to wash and dry your fabric before you begin. Click here to download the swing tunic pattern. The pattern, as written, will make a tunic. I added 18 inches of length to the pattern to make a dress. Because my fabric was quite stretchy, I ended up cutting off about 6 inches to make a midi-length dress. 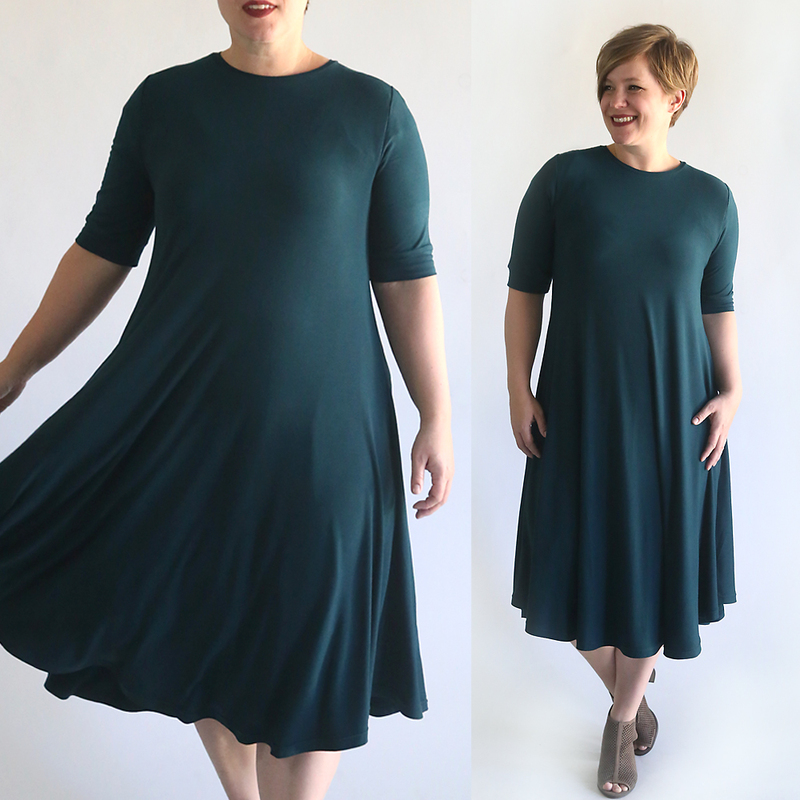 Not all knit fabric is quite so stretchy, so I think adding 18 inches would give you a good length to work with if you’re shooting for a midi length dress (especially for people who are taller than me – 5′ 3″). Adding 12-14 inches is probably plenty if you’re going for knee length. You can also lay a dress that’s the length you’d like over the pattern and measure how much you’ll need to add (remember to account for a hem). This is how I laid out my pattern pieces on my fabric. The solid lines show the actual pattern, and the dotted lines show where I cut the pieces to add 18 inches in length. I cut the front piece on the fold, and the back piece along the selvedge edges, meaning there is a seam down the back of the dress. If you want to avoid a seam and cut the back on the fold as well, you’ll need 3 to 3.5 yards of fabric. 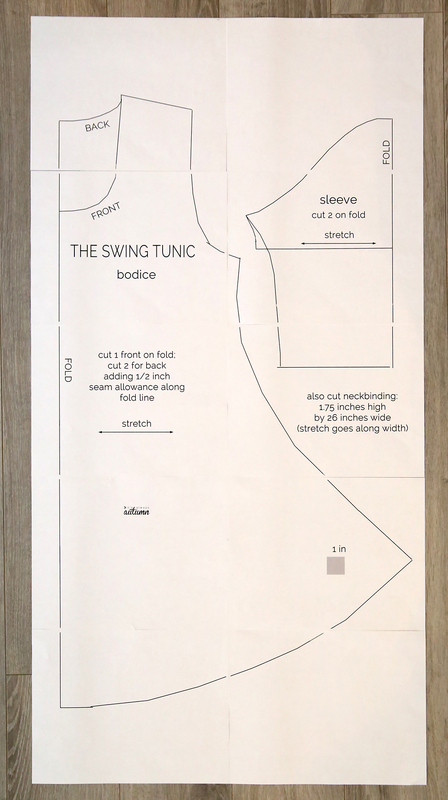 For full sewing instructions, click through to the swing tunic post. The sewing process is exactly the same for the dress and tunic; the only difference is the length. I cut the front neckline quite a bit higher than indicated on the pattern for a crew neck. It’s probably 2 inches lower than the back neckline. I added “cuffs” to the bottom of the elbow sleeves instead of a normal hem. Other than that, everything else is just the same as the tunic with a longer length. Hope you enjoy this swing dress pattern! Note: this is the fabric I used for this dress. It’s very soft and very stretchy, but a tiny bit lighter weight than I was hoping. It’s not sheer, but does show bra outlines so a slip is necessary. Thanks again for another great pattern! Now I need time to make all your pattern variations! Lovely work! I love this dress and will have to give the pattern a try. Thanks Autumn! So super cute! Thanks for sharing the how to. Beautiful, Autumn! Thanks again for sharing your posts with us! 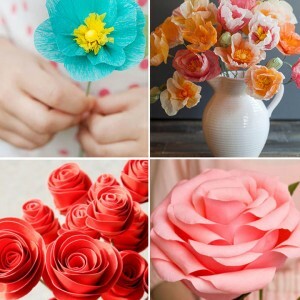 I love all if your patterns and tutorials! Where is your favorite place to buy knit fabric online? My local stores don’t have much in the way of good, opaque knits. I love this dress, made 2 and then decided to make t shirts as well. So easy and so many wonderful comments. 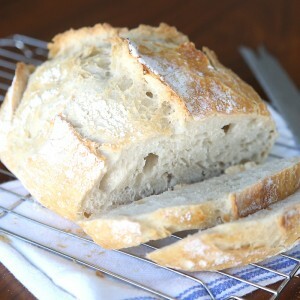 I can whip one up in 30 minutes or less. I use my serger for seams and double needle for heming. 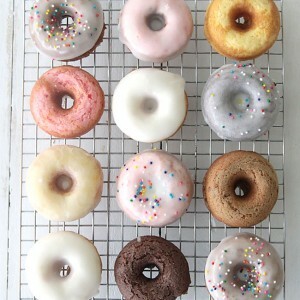 Everyone thinks these are store bought! lol This is the first time in 30 years that I really like sewing for myself. Thank you so much for this pattern! I love swing dresses and so glad I found your work!! You make it look so easy! I’m a newbie and super over-analytical and yah…get nowhere, Lol. I want to do a shorter, almost cap sleeve, (Eek) and shorten to an above the knee dress with the back longer than the front. Oh my, right?!! Sooo…I’m thinking I should make this exactly first and get used to the pattern/idea first. Any ideas?!! Thank you for your time and pattern!! Question – do you think it would be easy to add a zipper on the side seam? Thanks! Thank you so much for the pattern! Since having cancer surgery I have needed looser fitting clothing that doesn’t bind and this will be perfect. I had nothing comfortable to wear to go to my doctor’s appointments or where I needed to dress up just a little. I can order fabric online, so I’m going to be in great shape very soon! I’m very grateful for your generosity! 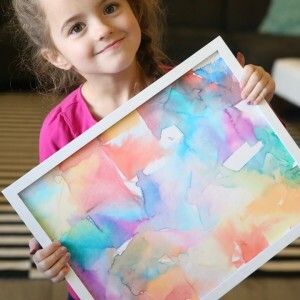 Thank you so much for doing this and sharing! We would like to make the swing dress exactly like you made it, with a higher neck, but with long sleeves. Do you know if that would be too difficult for a novice level of experience? I wondered if anyone had tried this as a sleeveless dress? I was thinking I could wear a little cardigan over it or something.